A few of the blogs that I follow do a really cool challenge called $10 at Target. 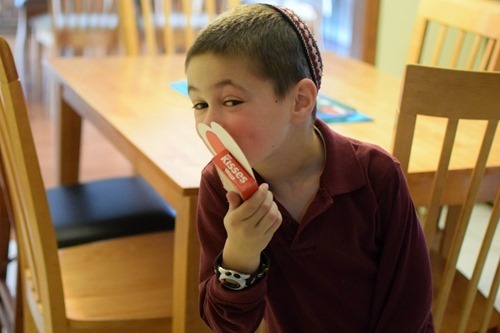 The idea is to spend $10 and only $10 buying fun items at Target. Let’s see how I did this month! When I arrived at Target on February 15, the staff was in the process of redoing the entire Dollar Spot. It was being stocked with spring, St. Patrick’s Day, and Easter related items. 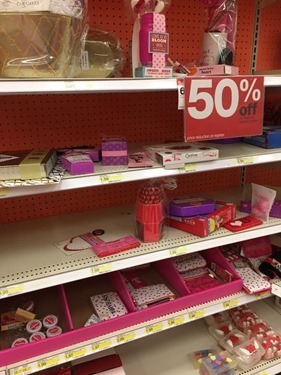 I gave it a quick scan, but headed to the back, into what was now the marked down Valentine’s Day section. Since it was only one day later, some things were 50% off and the candy was only 30% off. 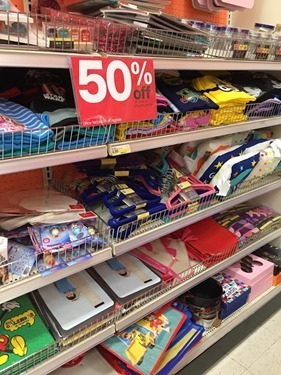 I’m sure there are bigger mark downs now! Also, the things that were previously in the Dollar Spot were now marked 50% off. From the regular office aisle – these were on clearance and I needed them for our Lego organization project (stay tuned for a future post!) – 2 Binders – $1.74 each. 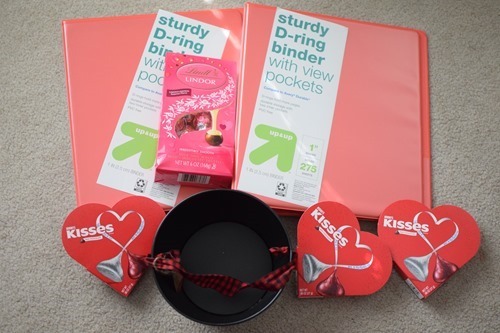 From the Valentine’s sale items – Lindt Chocolate – $3.14. And for the kids – Hershey’s Kisses Hearts – $.70 each. From the former Dollar Spot Items, for containing Simon’s pine cone collection (will also appear in a future post!) – Black and Red Pail – $1.50.